When I place a note into another note is there a way that I can get that note to appear in the parent note without manually going into the parent note and moving the child note so it will appear. I'm new to TB. Thanks! I assume you refer to map view, and the the container viewport of its child map? If so, in short - No. Not tried but you could set an OnAdd action for the container such that when a note is added, the parent (i.e. container's) $MapScrollX & $MapScrollY are set to roughly the $Xpos & $Ypos of the new (or moved) note). However, TB places new child notes (in map view terms) to the right of existing notes so the effect of the able may be to show only the new child in the parent's viewport. That may be OK, but I thought it worth mentioning. Sorry for lack of the usual aTbRef links, I'm on leave in the English countryside thus data speeds are about the same as in the Gobi Desert. Typically, when you drag a note into a container in map view, that note will be visible in the container's viewport. Sometimes, it'll be covered by the title bar; you can drag the container background to scroll the note intro view. Thanks, guys. I guess I'll just live with it as is. 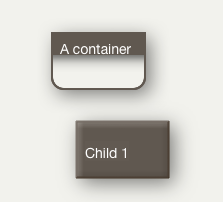 Again: dragging the background of the child container will scroll the child containers viewport. True, but this is often a hit or miss proposition. I've often found that the newly added note is way off in some corner of the page and the most expedient way to find it is to enter the parent note and select cleanup from the menu. I guess I'd like it if the added note was visible in the parent note from the get-go. For clarity, you reposition the child map in the parent container's by clicking and dragging anywhere on the background of the child map. If you click and drag on a note on the child map, Tinderbox will assume you are trying to move it up not the current map. Once a container's viewport is dragged, the position is recorded as custom values of the container's $MapScrollX and $MapScrollY. The parent's viewport $MapScrollX is drawn halfway across the interior of the container's icon (i.e. parent $Width/2) though depending on $TitleHeight the position itself may be obscured. Likewise $MapScrollY is drawn at a position of approximately parent $Height/2. This seems to work even if the most recently added child item was dropped/created in another view (I tested using Outline). Edit/footnote: it's probably worth mentioning that if dropping a note onto a map container, you don't really have any control where the note ends up in the child map. If the there is a note in the middle of the current viewport, Tinderbox will attempt to find an empty space close to, but not overlapping, the other note. Usually the drop it to the right/down from the other note. Also, if the parent viewport is big enough you can drag child notes on the child map in the view port - though in practice it's easier to drill down to that map and tweak the layout there. Very nice, Mark. That seems to work fine. Not to belabor the point, it doesn't solve the problem (?) of when you delve into a container using the down arrow and find your notes in the lower right-hand corner of the screen, reposition them to the center and then when you go back to the container with the up arrow your child notes are no longer visible in the container note. I suppose I'm looking for the container alignment to stick. Maybe I'm being a bit OC but it bothers me to lose my nice formatting. I don't know what process - if any - remembers where you last were on a child map, but I don't think it's $MapScrollX/Y as these relate to what's shown in the viewport. I'm not 100% sure that drill-down to a child map opens the area shown in the viewport. This aspect is hard to document by user testing as the design intent of navigating up/down maps isn't known. There's what we assume or want ... and what actually happens. You can try using the same action code as above, but stored in a stamp. When on the child map, select a note [sic] that you want to be in the middle of the parent viewport and apply the stamp. Now when you navigate up it should be in the parent's viewport. I'd assume it will also remain the point when you next drill down. The latter said, something overlooked by those who primarily/only use map view is that you might 'arrive' in a map by switching from another view and it might be less clear what the 'start' location should be. Plus if you've selected a note (e.g. showing the original of an alias in an agent) that isn't in the parent's viewport area - which should Tinderbox show? If the viewport of the parent is the start, the selected note will be on the map but hidden off-screen. I mention this only to show the navigation up/down map view is more subtle than assumed when just focused on one particular aspect of this use. In this case, the user applying a stamp to 'reset' the parent viewport might be the solution. I'm not sure the app can always guess the user's next intent navigationally.